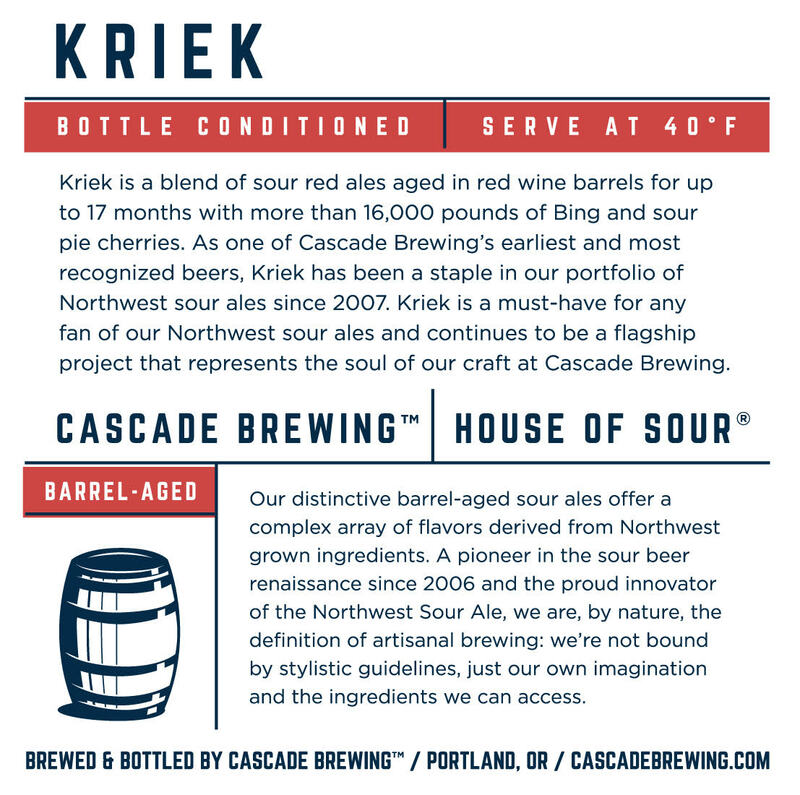 PORTLAND, Ore – On May 2, Cascade Brewing will release its Kriek 2016 project in bottle and draft at its two pubs – Cascade Brewing Barrel House and Raccoon Lodge – and through its distribution channels. Kriek is a blend of sour red ales aged in oak wine barrels for up to 17 months with Bing and sour pie cherries. The beer features complex flavors of cherries, roast malts, oak and spice, and comes in at 7.4 percent ABV. Not only will this be the first offering of Kriek in the new label format, it also signifies the return of the beer rated the “Top Sour Beer in America” by the New York Times last fall. Soon after that article came out, Cascade sold out of all the remaining Kriek 2015 in stock, as well as any 2014 that remained. 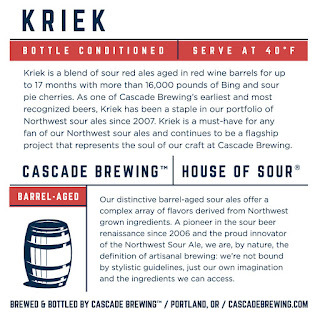 Kriek 2016 is a tier one offering; Cascade’s three tiers are based on the ingredients used in the beer, the time the beer is aged in the barrel, and the type of barrel used – all of which establish the pricing tier of the project. The bottle features Cascade’s new graphics, in which each beer within its tier has its own color to delineate between brands. Cascade Brewing has been a pioneer in the sour beer renaissance since 2006 and the proud innovator of the Northwest Sour Ale. Its distinctive sour beer blends feature fruit forward, barrel-aged ales with an emphasis on project year-to-year variation. These beers offer a complex array of flavors derived from the acid, the fruit and the residual flavors present in the barrels in which they age. The resulting beers offer a complex array of flavors and aromas derived from with each project year release capturing the unique subtleties of that year’s growing season. Cascade’s sour ales are brewed and blended in Portland, Oregon.